Sometimes it seems like you’ll never be able to start saving money. There is always some expense knocking at your door. However, if you begin to take a lot of little money-saving actions today then you can actually start saving money easier than you think. Here are 20 tips that you can follow to start saving money immediately. 1. Give up one small vice and put that money in savings. For example, stop drinking soda and take all of the money that you used to spend on soda and stick it in your savings account. 2. Give up one big item in your life. For example, go car-free or sell your big screen TV. Consider downsizing your home. This big savings will really jumpstart your savings and get you on a roll. 3. Reuse old items. Do what you can to recycle items instead of throwing them away. This often means you won’t spend money on unnecessary new purchases. 4. Delay your gratification. Save up and pay cash instead of putting expenses on a credit card. This means you won’t go into debt and you won’t pay unnecessary interest on your purchases. 5. Throw away or turn off all advertisements. You will get a lot better at not wasting money on impulse purchases if you learn how to avoid ads that entice you to make those purchases. Or at least use coupons. 6. Make your own items when you can. For example, make household cleaners yourself instead of wasting money on expensive chemical cleaners. 7. Only buy items that are on sale. You’d be surprised how much money you can save if you wait until something goes on sale before you buy it. 8. Wait thirty days before making a big purchase. You will often discover after the time passes that you don’t want to spend the money on that item after all. 10. Quit the gym. You can work out for free so don’t pay a lot of money for a gym membership or access to a yoga studio. Save that money instead! 11. Get an energy audit. You may be wasting a lot of money on heating and cooling your home. An energy audit is a smart expense to show you exactly where leaks are in the home so that you can stop wasting money each month on your energy bills. 12. Start engaging only in free entertainment. There are so many free ways to be entertained. Don’t spend money on this part of life. 13. Use the library. Don’t pay for books when you get books for free at the library. Also get free ebooks online. If you do need to buy a book, such as a textbook, buy it used and then sell it when you are done using it. 14. Order only one item every time you dine out. Don’t get a drink, an appetizer, an entrée, and a dessert. Get one thing. Your dining out savings will be dramatic. 15. Eat in-season local produce. A diet that is comprised primarily of in-season fruits and vegetables that are grown in your local area is an affordable diet. Save money by reducing your consumption of packaged goods, junk food, dairy and meat. 16. Only use free apps. You can spend a surprising amount of money downloading cheap paid apps and songs for your phone. Make it a rule to only use apps that you can get for free. You’ll start seeing savings immediately. 17. Consolidate your debt and start chipping away at it. This will make it easier to save money over time. Pay off the debts with the highest interest first if you aren’t in a position to consolidate them all. 18. Budget and track your spending. This is one of the most important things that you can start doing today to make sure that you don’t waste any more money. 19. Reduce your monthly spending by 10%. Find a way to spend 10% less this month than you did last month. Put that ten percent into savings to grow it with interest. 20. Set goals. Make short-term and long-term money-saving goals to get on track with saving money today. Write these goals down, join a goal sharing community online or a make a commitment to your spouse to meet these goals. Hold yourself accountable. 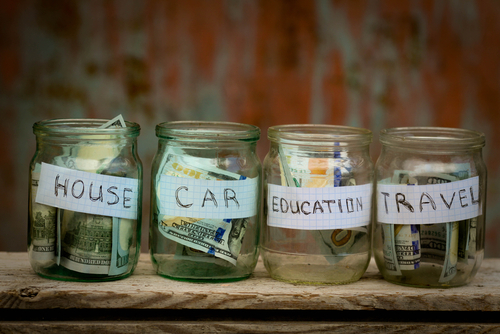 Just setting the goals is a great step to take to start saving money.